The evolution of the financial markets is undoubtedly subject to random short-term fluctuations. However, in the case of assets with long-term drivers, such as equities or bonds, market performance eventually converges with their real economic return. Indeed, the continuous accumulation of gains ends up eclipsing the effect of the erratic movements of the financial markets. It is this economic return, and this return alone, that the investor can reliably harvest. On the basis of this convergence, appropriately defined objectives can be achieved by investing in assets with long-term, predictable return drivers. An effective investment strategy must be simple to understand, easy to implement, transparent, inexpensive, and grounded in logic and common sense. With such a strategy, it is possible to stay the course and behave wisely during periods of stock market turmoil. Arranging for assets to be managed without first defining the objectives or specifying an effective strategy opens the way to manipulation and disappointing results. Clearly defining the investment objectives and the strategy by which they are to be achieved is therefore an indispensable factor for investment success. Short to medium-term predictions, whether based on judgement or models, are notoriously unreliable. Their use by asset managers is not only futile but also seriously compromises investment success. This graphic shows that forecasts are useless. 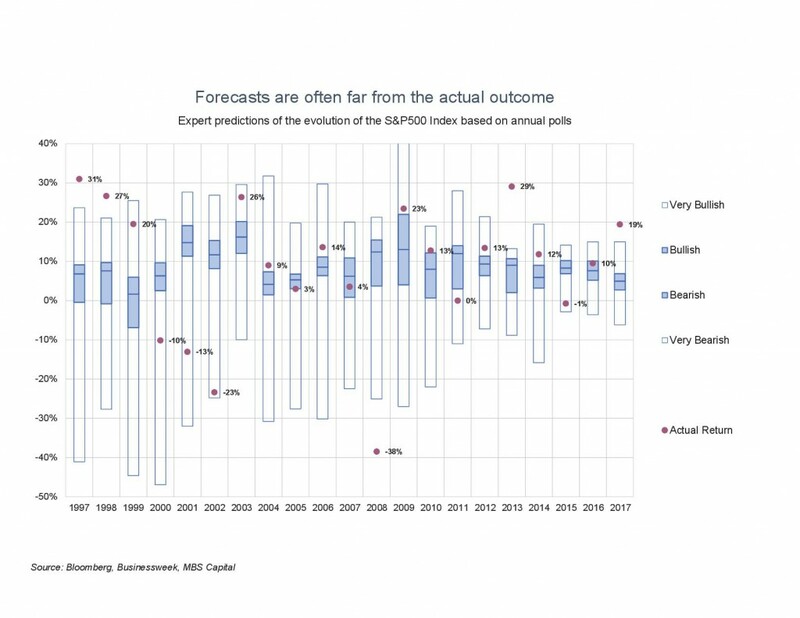 It is taken from forecasts of the movement of the US market (Standard & Poor’s) made by an extensive panel of forecasters selected by Businessweek for its end-of-year issue. For the first year (1997) the forecasts ranged between -41% (most bearish forecast) and +24% (most bullish forecast) with a median of +6.8%. The second quartile of forecasters predicted a rise of between +6.8% and +9.1% and the third quartile expected a movement between -0.4% and +6.8%. The actual movement one year later was +31%. It may be seen that the actual movement for each year always fell outside the predicted range or in an extreme quartile, except in 2007 (When this data stopped being published in 2006, the figures were gathered by us, mainly from Bloomberg).